I love pineapple tarts! They are certainly one of my favourite chinese new year cookies. This year, we have been busy trying to sell our flat and so I haven't had time to bake at all. However, I would certainly like to try this some day. Hopefully next year! 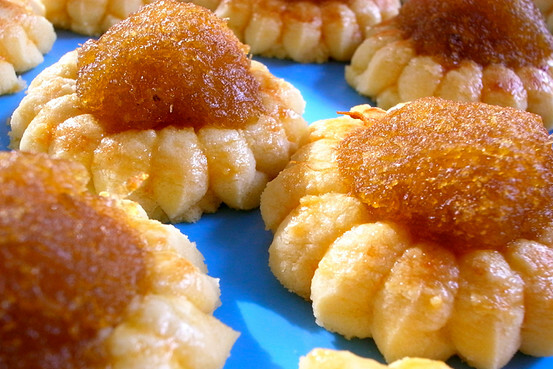 There are many different types of pineapple tarts. I have a preference for the open-faced pineapple tarts (seen in the image below). I googled for a recipe to try and found this one from Cheryl Lu-Lien Tan shared on the Wall Street Journal. It looks simple enough and I like the butter flour ratio which I think is key to the perfect buttery and crumbly pineapple tart. Quantities aren't exact. My aunts don't use a recipe, and they laughed at me the first 10 times I asked them for this one. The first set of instructions they gave me for pineapple jam was, "Aiyah, you just juice the pineapple, add sugar and then boil, boil, boil!" The jam is done when the pineapple mixture has changed color from bright yellow to brownish ochre and most of the liquid has evaporated, leaving a dense but moist jam. With a mixer on low speed, combine the butter, flour and four egg yolks, mixing for 3 to 5 minutes. Place dough in a cookie press fitted with a disc featuring a circle of diamonds. Press cookies out onto greased baking sheets. Form small balls of dough and press each one into the hollow of a cookie, forming the base of the tart. Beat the remaining egg yolk with ½ teaspoon of water. Brush the rim of each tart generously. Take a scant teaspoon of pineapple jam (more or less, as desired) and form a ball, then press into the hollow of each tart. Pat the sides of the jam to create a small dome. Bake for 15 to 20 minutes at 350 degrees, until golden brown. Remove cookies from sheets and cool on a rack. This other recipe also looks pretty good. It only requires canned pineapples which probably saves quite a bit of effort.